No6 Shaft at Cinderhill (Babbington) (Nottinghamshire) was sunk 140 yards (128m) to the main bright and to a total depth of 600 yards (549m) at a diameter of 18 feet 2 inches (5.53m). An electric winder was installed to wind 60 draws to the hour with twin decks holding. Essential Work (Coalmining Industry) 1943 came into force on 6th April. Some experienced men were fetched back from the forces to work in the mines. The Coal Act 1943: Under many leases, notices of approach had to be sent to certain surface owners when workings were approaching certain specified buildings. This often involved giving notices to third parties and occasionally resulted in coal being sterilised for support purposes. In order to regularise such working, Sec 11 of the 2nd Schedule of the Coal Act 1943 vested in the owner rights to work such coal without notice, provided any damage caused by such working was accepted by them and compensation paid or damage made good. As with the 1938 Coal Act, under Paragraph 6 (3) the surface owners may after the Para 6 notice first being published, request the NCB to examine any plans and specifications of any proposed building about to be erected within the area of the notice for approval of design. If reinforcing was recommended to withstand future mining subsidence then the surface owner could be reimbursed for the additional expense. Of course there were many complications as you can imagine, particularly in already densely occupied areas. It was deemed that if the developer declined the advice, the NCB would only be liable for damage to a building which it is estimated would have occurred should the recommended structural precautions have been incorporated. This was after the publication of the notice. During June 1943, North Derbyshire miners were the first to win an output bonus of 6d (2½p) a shift. Harry Hicken became Regional Labour Director. The war industries were demanding more and more coal. With this soaring demand a miner could not leave his place of employment without permission from a National Service Officer. Coal prices were regulated and the Government continued its grip on the industry by making physically fit ex-miners return to the pits as well as surface workers being drafted underground. Some did not relish this and refused, and were penalised by a jail sentence. There were 16 lads on the surface at Newstead (Nottinghamshire) (Newstead Colliery Co), hoping to go into the forces and 15 of them were cajoled into going down the pit, however Sidney Page a young surface worker refused to work underground for the War effort and was jailed. He had wanted to join the Royal Navy. He was sacked and collections were made for him. The Courts sentenced him to 30 days in Lincoln Gaol. The men came out on strike on Monday 13th September 1943, followed by all the Leen Valley pits, bringing the Nottinghamshire Coalfield to a halt, however the Home Secretary Herbert Morrison ordered his release when Page agreed to go underground, providing he could have his surface job back after the hostilities ceased. A mass meeting of striking miners was held in Hucknall and were assured of his release after 8 days in prison and there would be no victimisation. On Friday 17th September 1943 the strike was over and the men returned to work the following Monday. Sid Page would go on to be a coal face worker and retire in the 1980s. On 28th June 1943 there was an explosion at Coppice colliery (Shipley Collieries Ltd), caused by a shot firing accident and an ignition of methane gas. 4 men were killed, all dying in Nottingham General Hospital from toxaemia, following burns. A mystery explosion had occurred at Bolsover on 15 April 1943 when 3 men were killed and 2 injured. An aerial ropeway was commissioned at Bolsover (Derbyshire) for the dispersal of spoil. A new fan was commissioned at Langton (Nottinghamshire) in 1943. Partial extraction of an old Top Hard pillar at Langton was effected using an 8BU Joy Loader gathering arm machine (Pinxton Collieries Ltd). It was an awkward shaped area and there was no conveyor system installed. Pony ganged? The Butterley to Cromford Canal was closed. Giltbrook (Giltbrook Colliery Co) at Awsworth (Nottinghamshire) was abandoned (Deep Hard or Lower Hard) headings abandoned May 1943, stood since 1940. Pumping restarted at the shafts until 1987. No1 had a Harland MRD / 51 250hp, 8 stage pump with a head of 563 feet (171.6m) rated at max 1,000 gpm pumping around 15 hours ave per day. No2 shaft had a Harland SBY / 12 230hp, 10 stage pump with a head of 470 feet (143.3m) rated at max 700 gpm. There was a 60hp winch for No1 shaft. The Coal Distribution Order, 1943: Emergency Powers (Defence) Coal came into force on 1st September. Miners’ free coal was exempt. The Ministry of Fuel and Power (Information) Order, 1943. Miscellaneous information to be furnished by persons carrying on coal mining undertakings. The Explosives in Coal Mines Order, 1943. This laid down the types of explosives allowed to be used in a coal mine. Pneumoconiosis Scheme, 1943. At last it was realised what damage was being done to the lungs by coal dust. The gin pit at Eckington (North Derbyshire) shown in the photo was only abandoned in 1943. It seems incredible that an 18th Century outdated and crude inefficient system of winding using horses and a gin could have survived to almost half way through the 20th Century. During September 1943 AB Meco Moore Coal cutter-loaders were on trial at Thoresby and conventional handfilling methods of 20 tons plus per man, per day. Rufford collieries (Bolsover Colliery Co), (Nottinghamshire) but at first were unable to match the handfilled output. The old original Arkwright drifts connected to Calow Main (North Derbyshire) (sunk by Staveley Co) and expanded into the Sitwell Seam and later the 1st Waterloo seam. During the Second World War evacuees were moved out of London and the South East to places in other parts of the country for safety and were billetted with local families, many in the Midlands and in mining. 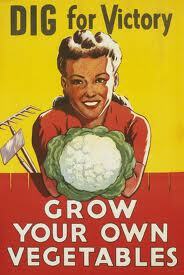 The slogans such as ‘Dig for Victory’, in other words grow your own vegetables were placarded, along with ‘make do and mend’ etc. All men from 18 to 25 had to register for service in HM forces, or alternatively were given work in coal mining or other important War work. However in 1943 there was still a manpower shortage in the mines and the much needed production of coal was falling. Norwood (North Derbyshire) finished production 7 May 1943 and was closed in June 1943. 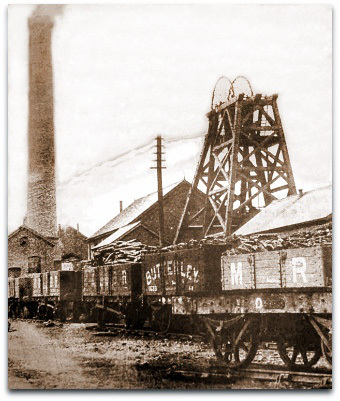 Sheepbridge Coal and Iron Co had sunk the colliery in 1865-66 to the Top Hard seam. It was subsequently sold to J and G Wells Ltd in 1914. It was also known as Holbrook No2 after this. The shaft was kept open for ventilation. Seams worked: Top Hard, Deep Hard Deep Soft or Flockton, Thorncliffe. 1943: 12 Flockton discontinued June, 5 s/f. George Walker (3903) – 1947. There were no Undermanagers then until 1920 when A Preston 1920-1943 (2nd) was in charge. Seams worked: Top Hard, Deep Soft (Flockton) and Thorncliffe (Parkgate). Training for new entrants into the industry was set up in 1943 under a special branch of the Ministry of Fuel and Power (including a special Training Inspectorate). 13 centres were set up in the various coalfields for the training of war-time entrants over 18 years of age. Several were in our area. Also a special Mechanisation Training Centre was established at Sheffield for running short courses for maintenance men and in the handling of American types of mining machinery, as at Silverhill where Joy loaders and shuttle cars were used in pillar and stall work in the Deep Hard seam. Timbering: Girders 9’ 0”, 1s 10½d (9⅓p), 10’ 0”, 2s 3d (11¼p), 11’ 0”, 2s 7½d (13p), 12’ 0”, 3s 0d (15p), 12’ 0” Cambered girders 2s 3d (11¼p), Arches 8’ 9” x 7’ 6”, 2s 3d (11¼p), 11’ x 9’, 4s 0d (20p), 12’ x 10’, 5s 0d (25p). Signed: on behalf of Stanton Ironworks Co Ltd:- Norman D Todd, Colliery General Manager; John Brass Agent; George G Heathcote Manager. 7th September 1943. Signed: on behalf of workmen at Silver Hill colliery:- HW Cooper, G Godfrey Senior, V Lindley, H Frith, G Godfrey Jun, JW Pickaver, A Connell, H Quincey, Jack Pitchford, JW Taylor, L Wall. 9th September 1943.